Deloitte recently released a survey it carried out with 10,400 business and HR leaders from 140 countries. The comprehensive report consists of responses from these professionals along with in-depth interviews and experiences with clients. The report’s major call to action is to “rewrite the rules” that will bridge the technological gap between the slow moving organizations and quick adapting talent pool. Here are some valuable inputs that would help you and your team in taking the right decision in matters relating to HR. 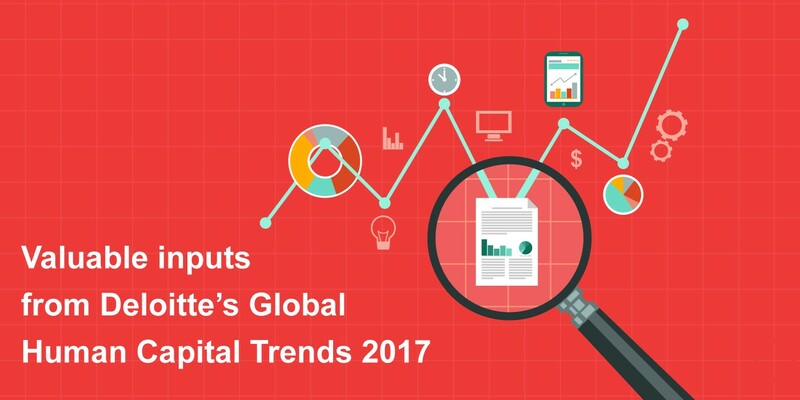 The foremost trend the research has identified is that one of the most important challenges in 2017 is to build organizations of the future. That is, organizations where agility plays the central role. Good bye to hierarchies, welcome empowered networks of teams. 83% executives participated considered it very crucial to redefine the concept of career, from its rigid and static nature, to a career that thrives on the ascending learning curve of the employee. 81% of respondents identified talent acquisition as the third most important challenge organizations face. The report gives a comprehensive description of the latest cognitive technology, especially Artificial Intelligence powered tools, that is transforming recruitment. HR is expected to transform in order to enrich employee experience, through culture and engagement. The employee experience is taken care of right from the time someone is a potential employee. Companies are actively looking for tools to support and improve the candidate/employee experience. The nature of performance management is shifting its focus from appraisal based approach to more inclusive continuous feedback and coaching methods. This works in tandem with the second trend discussed above. 80% of the respondents cited leadership also requires change. Traditional leadership hierarchies are challenged to give rise to a new model of leadership which is able to grasp the digital transformation of work. Technology is revamping workplace and workforce. There is an urgent need for HR to adopt the latest HR Tech that is changing how people work and how people interact at work. While only 8% of organizations have reported to be using people analytics, people analytics emerges to be one of the important trends in Deloitte survey. Respondents also reported that diversity and inclusion are frustrating and challenging for most organizations. 41% of participants confirmed that they have fully implemented or made important progress in adopting cognitive or artificial intelligence technologies. This gives a sneak peak into the future work force, which will include machines and software as well.